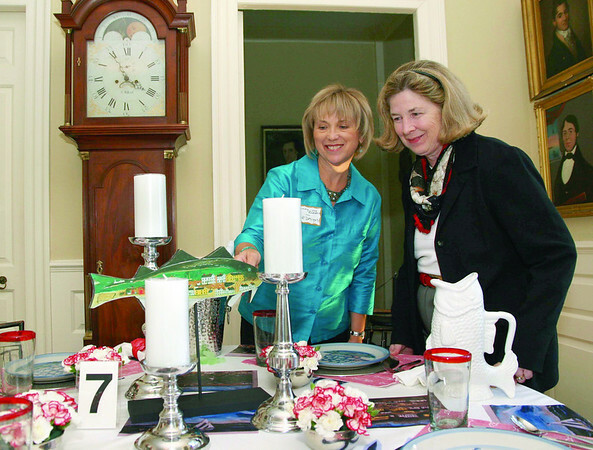 City Desk, Marblehead:Ê At left, designer Ginny von Rueden, shows her Tablescape "J.O.J. Frost and Fishing" to Pam Peterson, museum director, both are from Marblehead.Ê von Rueden is the proprietor of VvR Designs, Marblehead at the benefit for the Marblehead Museum and Historical Society, Thursday, at the Jeremiah Lee Mansion on Washington Street. Photo by Frank J. Leone, Jr.